Sawgrass offers high-performance sublimationInk for a wide range of applications. Whether you need to personalize one product or mass-customize one million products, Sawgrass can help you select the right ink to deliver vibrant, durable images that will keep your customers coming back for more. Sawgrass offers high-performance sublimation Ink for a wide range of applications. Whether you need to personalize one product or mass-customize one million products, Sawgrass can help you select the right ink to deliver vibrant, durable images that will keep your customers coming back for more. Sawgrass Industrial’s SubliM Reserve Dye Transfer Sublimation Ink is specifically formulated for DX5 printhead technology, allowing for digital printing on both polyester fabrics and polyester-coated hard surfaces. 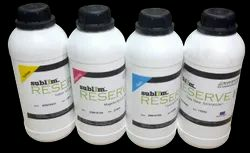 Sublime Reserve delivers excellent print quality, reduced downtime, and uninterrupted printing.